In our new designed heat exchanger, the heat produces in combustions chamber is absorbed better than the traditional versions. This ensures more uniform baking with lower energyconsumption. New built-in vertical plate steam unit supplies abundant moisture to every part of rack. Our rotary ovens are produced with side burner which is suitable long, narrow rooms and in extra compact dimensions. 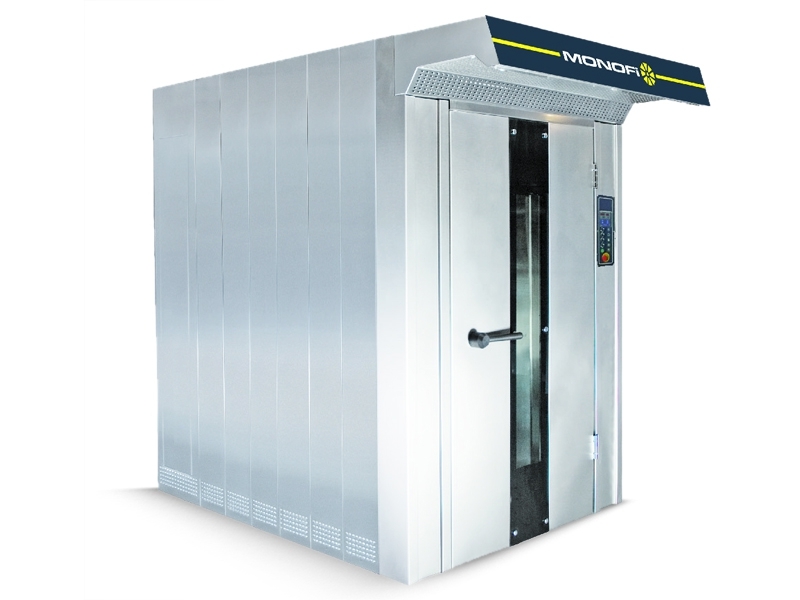 Therefore, our rotary ovens are ideal for installation in any bread or pastry shop. Burning chamber is made of heat resistive (more than 1000 centigrade degree) special stainless steel (AISI 321 S). Front panels and all outside covers are completely made of stainless steel material. Therefore, it doesn't get darkening and rust. By means of halogen lamps which are mounted the doors, an excellent illumination is obtained and these lamps enable to be changed from outside of door, it is strongly recommended that a water softening unit is fitted tothe water supply of all ovens.